It was my first visit to the city of Kolkata. I had straight away flown to Kolkata after meeting Amulya and calling off our engagement. There were more than thirty missed calls from home. Clearly, I had managed to create a huge chaos back home. I was not in a position to answer their anger and justify my decision. “Kamalini nagar?” I asked the taxiwala after exiting the airport. The forty looking driver had neatly combed his hair. Hair oil dripping on his forehead reminded me of my childhood. “You can take the metro. It goes there” he replied. I understood it as his rudeness and went to a taxi which was parked couple of meters ahead. “Kamilini nagar?” I asked him. “Sorry sir. It’s already booked” he replied. Now that was polite. I was about to go to the next one when the first guy came back to me. “Sir, Kamalini nagar would take you more than one and half hour. You have to go via Newtown market where traffic refuses to move. If you go by metro it would take you less than thirty minutes. Saves you money as well” He said. This guy was trying to help me save my cash and time. I was surprised. “Oh. I am new to this city. 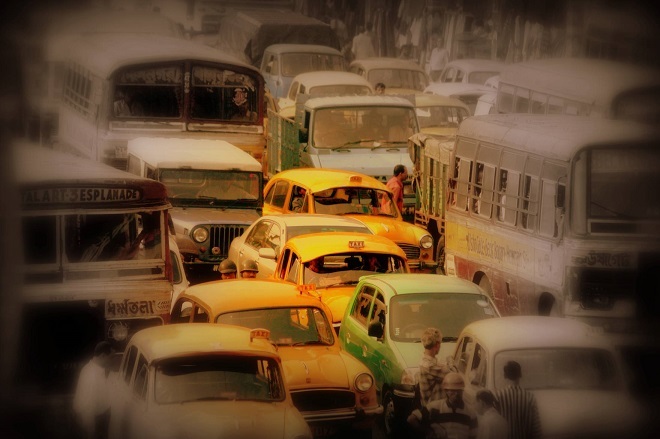 Moreover, a taxi ride would give me an opportunity to look at the Kolkata life little more closely. So.. you know” I grinned. “If you want to have a closer look, you should be opting for a bus ride. But if you are keen about taking a taxi, I am at your service” he winked. “This is the Newtown market that I was talking about”, the driver said. I could see a sea of car roofs and helmets ahead of us. I wondered if I should call up Anahita and tell her about my surprise visit. The next moment I realized that it’s against the ‘rules of giving surprises’. Moreover, I was unsure if Anahita would answer my call – she had never, in those last four months. I felt like having a conversation with the driver. When you think of Kolkata they all come to your mind – Trams, British buildings, fish markets, rasgullas, Sourav Ganguly and hand pulled rickshaws. “Trams are not for long distance commuting. Till my age 30, I had always thought that trams are present all over India and so was my idea about hand pulled rickshaws. It was surprising for me to know that it’s only here in Kolkata, that you get to see them” he felt proud as he spoke. There was no sign of the traffic jam to melt down. We gradually shifted topics from Bengali movies to IPL cricket, fish recipes to state politics, Bengali accent to byomkesh bakshi. The more I spoke, the more I got to know about Bengal. I was surprised to know that the surname Banerjee is as same as Bandopadhyay, Mukhopadhyay is another name for Mukherjee. Similarly, Chattopadhyay for Chatterjee and Gangopadhyay for Ganguli. So Sourav Ganguly could also be addressed as Sourav Gangopadhyay and Anahita Bannerjee could be called Anahita Bandopadhyay. The kid inside me felt like surprising Anahita by calling her with the other surname. “On office work?” he asked casually. “I am here to meet my lover” I replied and looked at him. The word lover sounded very bookish and odd to pronounce. I turned brick red in embarrassment. “Oh.. Love story?” he smiled. “Even I had one” he added. “Oh.. that’s great. !”, I said. Everyone has a love story, there’s nothing great about that. However, when someone tells you that he has a love story, you got to act courteous. But, wait a minute..! He said that he ‘had’ a love story. “What do you mean by had? Is she married to someone else now?”, I asked. It opened up a new conversation about his sweet, short and a sad story of love. His name was Shoorjit. He was nineteen when he had first arrived in the city of Kolkata. His uncle’s friend had promised to arrange a job for him. He landed up as a driver in one of the many cars owned by Swarnava Chatterjee. Swarnava Chatterjee owned a diamond jewelry chain in Kolkata. He had the responsibility of driving Swarnava’s wife and daughter Mrinalini, who was visually impaired, to their music classes. Shoorjit had no great talent apart from his driving skills and storytelling ability. Every day, he narrated stories while he drove the mother and the daughter to their classes. His stories, often inspired from his childhood and neighborhood incidents, had elements of innocent humor in them, managing to leave the Chatterjee’s in splits. Mrinalini fell in love with Shoorjit and so did he. Swarnava had no qualms about it. He had them married with all festivity and grandeur. Mrinalini’s blindness was never a handicap to their relationship. Mrinalini died within a month of their marriage, in an accident. Following her death, Chatterjees had offered to transfer all their wealth to Shoorjit. With all dignity, Shoorjith declined it and chose to live his life on his own terms. It had been eight years since her death. He could have remarried. He could have lived a luxurious life with all the wealth that Chatterjees had. For some strange reasons called ‘true love’ and ‘self-respect’, he decided to continue as a car driver and lead a lonely and happy life. ‘Dew drops’, read the board on the gate. Anahita’s house was a two floored one with clay tiled roof. East facing balcony had a mini garden. The house was situated in a scarcely populated area surrounded by silver oaks and construction sites. After waving a bye to Shoorjith I quickly pulled out my cellphone and typed out a message. “Hey Anahita Bandopadhyay. Guess who’s near ur gate”, and sent it. My attempt at humor was aimed at diluting the tension that had made it’s living between us. I was standing next to the door shocked, confused and scared. Anahita was on a wheel chair. Chained to window grills was her German shepherd barking wildly. It was biting the loosely tied nylon strip around its neck every now and then. In any minute it could break free. “I don’t know. Since morning Snoopy is acting this way. I don’t know what to do. !” She was trembling in fear. “Anahita..!! What..” I found it difficult to complete my question. I pointed at the wheel chair. ‘Is she okay? What’s with the wheel chair. Has something happening to her legs’, I was lost in distress. “I don’t know what to do Sid. I am scared.” she held my shirt in fear. She was not in a position to answer all those questions that had made home inside me. The dog tried to leap towards us, barking ferociously. “Where is your mom?” I asked and closed the door behind. It was important to not let the dog go out of the house, in case it manages to slip the chain. “Sid..! Do something” she cried again. “Do you think its Rabies?” I tried to put forth my doubt. “I don’t know Sid. But, it has never been like this”, she was trembling. Events that I was surrounded with, was too much for me to handle. The dog appeared to have turned mad. “Did you call up veterinary?” I made a quick enquiry. I dialed a local veterinary hospital’s number but no one answered it. I tried calling city Municipal Corporation in a hope that they would send the dog catchers. The result was however the same. The dog tried to leap again with all its might and started biting the chain. Yes. I should kill it. This seems to be the only option, I thought. The two and half feet tall animal started ravaging the neck belt with even more intensity. The danger of getting savaged was inching closer. Animal lover that I was, it was becoming increasingly difficult to live with the thought of killing it. Doing so in front of its beloved owner was perhaps the most difficult situation that any person can get into. “Sid.! Do whatever you want. Kill it” she said crying helplessly, even before I could tell her my intentions of killing it. I ran in to the kitchen and grabbed few eggs and started hurling them towards the dog. The smell of the smashed eggs managed to attract its attention and it stopped barking. Slowly it started licking them all. I then smashed few more in a small bowl and started pouring phenol into it. I couldn’t think of any better agent of death. By now, the dog was done with the eggs on the floor. I threw the bowl of phenol mixed egg yolk at the dog. It toppled after landing near the German shepherd and the yolk was again all over the floor. If all goes by the plan it should be dead any minute, I thought. The dog sniffed the mess for ten- twenty seconds and looked back at us. It had stopped barking and its eyes had turned cold now. Eat it – I mumbled. It started sniffing the liquid again. It was only then it occurred to me that it was next to impossible to poison a dog- the animal gifted with a superior sense of smell. In a strange turn of event, it was now looking peaceful; the ferociousness in its eyes could no longer be seen. “Sid..!! Snoopy looks okay now. See it’s not barking. Thank god we didn’t poison it” she said and slowly started wheeling towards the dog. “Anahita don’t” I was yet to complete when the beast resumed its act. It lunged violently at her, barking madly while doing so. Anahita screamed in fear and I pulled her chair towards me. Here there was Anahita on her wheel chair, reason to which I was yet to find out and there was this dog which was threatening to tear us apart. My mind turned numb. I asked her where the store room was and hurried in the direction that she pointed. I came back running with a long metal rod. I was in a combat with my conscience. “What?” Anahita was further shocked. The dog had again started biting the collar belt. “I don’t know”, said I and landed a heavy blow on its head. The dog let out a huge cry and started beating its legs in pain. Anahita screamed too. Snoopy looked at her helplessly. It no longer appeared a beast. At this moment, it was a feeble animal begging for its life. It was that lovely pet of its owner, which was looking for her to save it. “Please don’t do this”, Anahita pleaded. That was the most heart breaking scene I had ever come across. I had neither the heart nor the courage to land a second blow. Tears ran down my cheeks and I dropped the rod. “I can’t do this” said I and took Anahita out of the house and locked the door. I was crying heavily. I ran up to a group of laborers working at a neighboring construction site. I held a bunch of blue colored notes at a forty looking muscular guy, explained him everything and asked him to kill the dog. He bluntly refused the offer. “It’s almost dead. It can’t attack. It’s just that I can’t see it dying. I can give you more money” said I, wiping my tears and took out my wallet. Kids aged less than ten were trying to hide their laugh, seeing a grown up man crying. “It’s not about getting attacked. And no.. It’s not about money as well. It’s about killing. I can never do it. Sorry sir” said he, this time politely. It was a moment of truth for me. “Someone please..!” I requested, but no one came forward. The group then directed me to an aged man named Mandodar sitting next to the concrete mixer. I offered two yellow notes to him. Anahita tried hard to control her emotions, standing outside the house. Each time Mandodar swung the rod at it, Snoopy let out its final cries of death. After a minute everything went silent. Mandodar came out of the house wiping his sweat. Till evening we had a couple of maids helping us clean the house. I made a veterinary doctor come to the house, offered him double the money and asked him to run a rabies test on the dead animal. I wanted to be sure that we didn’t kill an innocent pet. I and Anahita didn’t have a word during the entire time. I had hundreds of questions about her sitting on the wheel chair. I held back all my questions, considering the situation that we were in. Moreover, I didn’t have the courage to speak to her. At about six thirty, her mom arrived. Anahita hadn’t told her anything about it till then. The dog incident came as a shocker to her. She went to the backyard and cried next to the place where we had buried snoopy. “I forgot to introduce myself aunty. I am Sid. I am Anahita’s friend” I said, soon after her mother came back to the hall, washing her tears off the face. “I know who you are son. I am surprised to hear that you are calling yourselves a friend” she spoke bluntly with a straight face. She knew everything about us. “Well aunty, Yes.. I am her boyfriend” I had to speak the truth that she knew. Anahita looked away. “And why are you here?” her mom asked me. Without a second thought, I replied, “To take her back to Bangalore aunty. I called off my engagement with that girl. I want to marry Anahita. I want to marry her right away”. Anahita looked at me in shock. Her mom continued to speak with a straight face. “I am afraid, I have to ask you to leave son” she said. I looked at Anahita. She was trying to act as if she was not paying attention. “Aunty please” I tried to convince her. “Sid. I said.. Leave”, her mom spoke again, like a strict principal. I turned at Anahita. In the afternoon when she had hugged me in fear, I had thought that the bitterness was long forgotten and everything was even between us. “Sid. you heard my mom”, said she in a tough voice and showed me the way out. I was not sure as what had earned me their hatred. -Engagement to Amulya or the death of the dog. “Let me explain Anahita”, I made a helpless protest. “You have already given enough pain to me, to us. I would hate to see you any more Sid”, said she. If she had cried while saying so, I could have assumed that she still loves me. But, she didn’t cry. She had a serious straight face. An expression that meant that, it was all over between us. Without any courage to speak any more and to stay any further, I stepped out of the house and disappeared into those dark streets. Click here to read the fourth episode.